It Could Happen to You – Did You See That One? 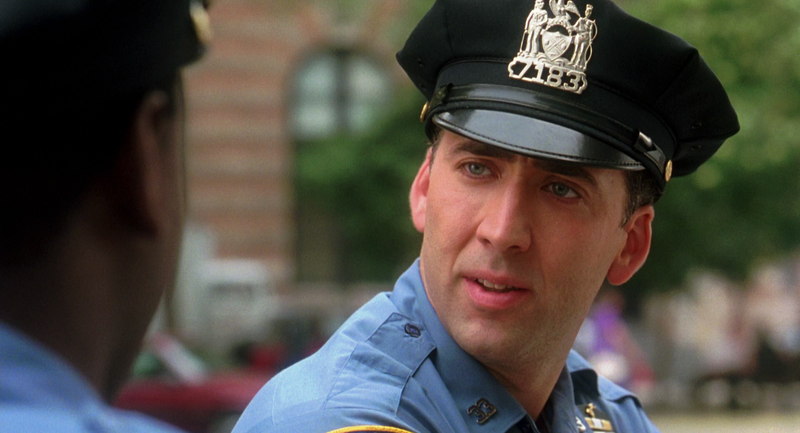 Charlie Lang (Cage) is a cop who always does the right thing. When he comes up short on a tip, he promises Yvonne (Fonda), the waitress, half of his lottery ticket winnings. When the ticket comes up a winner Lang is ready to uphold his end of the bargain in spite of his wife’s (Perez) objections. This is a romantic comedy that fit in with the 1990s when it was released. The screenplay was written by Jane Anderson (How to Make An American Quilt) and the film was directed by Andrew Berg (The Freshman). The film stars Nicolas Cage (The Rock), Bridget Fonda (Jackie Brown), Rosie Perez (White Men Can’t Jump), and Wendell Pierce (Selma). This is a goofy and entertaining romantic comedy. The story is relatively simple, but built around a unique and interesting premise. Like most romantic comedies, there is little doubt as to the outcome. It’s all about the journey with this one, and the writing does a good job tweaking and twisting things to make it fun. The characters are all unique, and seem designed to create the right kind of dynamics for the story. The dialogue is also nicely written. While the story doesn’t break new ground, it does everything you expect a good romantic comedy to do. The acting in this movie is much like the writing; it does everything you expect it to. Nicolas Cage and Bridget Fonda have great chemistry on the screen in this one. Each of them seems fit for the life of the character they’re portraying. Cage does a good job bringing in the frustration, especially when in his scenes with Rosie Perez. Perez is her normal fingernails-on-the-chalkboard self, bringing out the right amount of tension to keep the story fun. Wendell Pierce also does a nice job playing alongside Cage in this one. The material is relatively simple, and the acting worked nicely with it. Overall, a good performance by the cast. This is just a fun rom-com that tells a fun story and pays off like you would expect. The production doesn’t do anything special, but it all works. If you’re a fan of any of the stars, make sure to check this one out. I would also suggest this to anyone who loves romantic comedies. I give this one 3.2 out of 5 stars.